He was Italian and Catholic, and he had designed several buildings for the Catholic Church. Then he was commissioned to design a church for the Anglican community at South Brisbane. 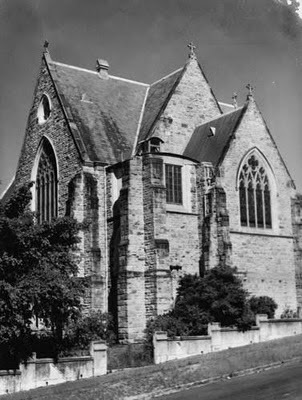 He was Andrea Stombuco, and this is the church that he designed - St Andrew's, pictured in 1947. It seems to happen frequently with grand churches. The diocese runs out of money before the architect's dream can be fully realised. That happened here - construction work started in 1878, but ceased before long because funds were depleted. They started on it again in 1882, finishing it in the following year; but Stombuco's plans included a tower and a spire that have not been built to this day. An extension designed by HWK Martin was added in 1887. Further work was done to enlarge the nave in 1931 under the supervision of Lange Powell. Here is the church today, this time from the eastern side. St Andrew's inhabits one of the busiest areas of South Brisbane. Roads on either side are main through-roads, and parking is scarce. I suppose things might be more relaxed on Sundays when the main congregation attends church, but on the day I was there I felt that I was risking life and limb to take today's photograph. Ha! think of poor old Milan where it took hundreds of years to finish their cathedral. Work might have St Andrews have started in 1878 and then restarted lots of times afterwards, but one assumes that Stombuco's original architectural designs remained in place over the decades. Or is that not so? Did each subsequent architect make additions and changes? The reason I ask is because tastes change, over the decades. The multi-coloured bricks, taking just one example, might have been from later decision-making. I featured an old Anglican church from Sydney yesterday that is now a Greek Orthodox church. Jim - Yes, I saw that post. Great minds.